Book your Stand up Paddleboard lesson now! 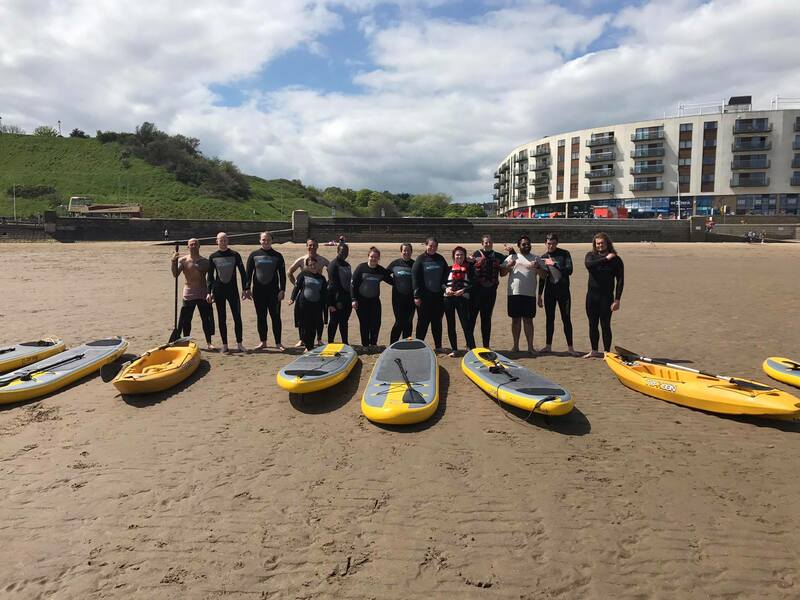 Why choose Paddleboard Lessons in Scarborough? Paddleboarding is a relatively new surfing phenomenon that adds a whole new dimension to riding waves and exploring our stunning coastline. It’s a fun, low impact, ‘all-body’ workout, making it a great activity for fitness as well as fun! This hugely popular activity is the fastest growing water sport in the world, and also a lot easier than you might think! After a couple of tries, most people can stand up and balance just fine – but if you’re a little unsteady on your feet, you can have just as much fun doing it on your knees! Lessons are available for individuals or groups. If you bring a few friends with you and have a minimum of 5 people, we can offer a private group lesson, just for you guys! We cover everything from beginner’s coaching right through to intermediate and advanced coaching. On arrival at the surf shop, we will show you where the kit is and assist you with finding the correct sizes. We will also offer any safety advice that is required for the weather and sea conditions on the day. Then you will be shown to our private changing rooms where you can get ready for your session! Once you are ready, head back downstairs and our team will hook you up with a board, paddle and Buoyancy aid (should you require one) and take you or your group to where the best conditions are to conduct your lesson. If you have any questions please let one of our team know and we will do our best to help! Our Paddleboard Lessons are open to people aged 6+ . Students under 10 must be accompanied by an adult for the lesson. If students are between 10 and 18, an appropriate adult must be on site to sign you in. We sometimes ask for ID if we think you look under 18, so please don’t be offended.